The 1981 unsolved homicide of Mary Harrison. 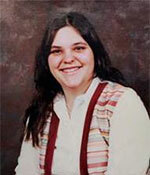 Mary Harrison, age 22, was reported missing by her husband, Walter Harrison, on October 15, 1981. Mary and her husband lived on Broadbrook Road in Ashuelot (Winchester), NH. Her body was found by a hunter on October 30, 1981 in the woods near Monument Road in Hinsdale. An autopsy determined that Mary died as a result of a gunshot wound to the head.